Racing Norton Manxes must be a disease. 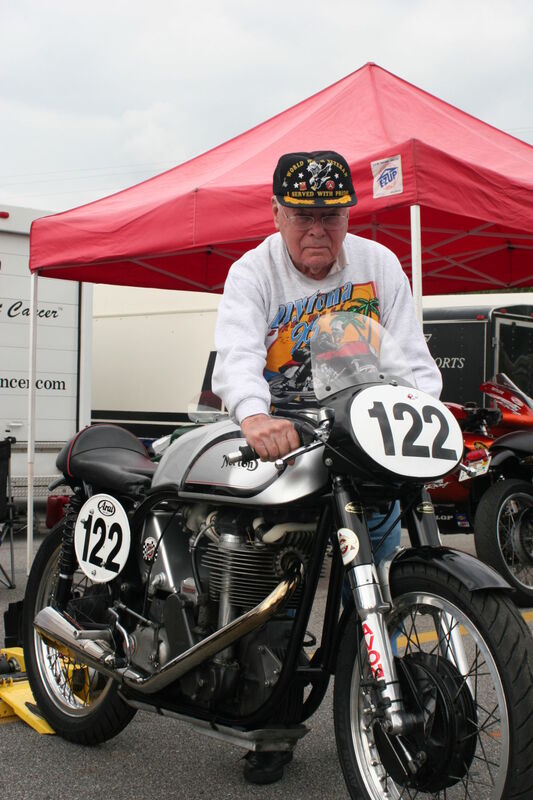 Our sponsor Bob McKeever, who passed away early in 2017, rode one at the Daytona 200 in 1948 on the beach and after that, thought of racing all the time. This is not a passion, but more like an addiction. Once you have heard one, smelled one, wrenched one and if lucky ridden one, well your life in no longer the same. A featherbed Norton Manx is what made MotoGP what it is today. 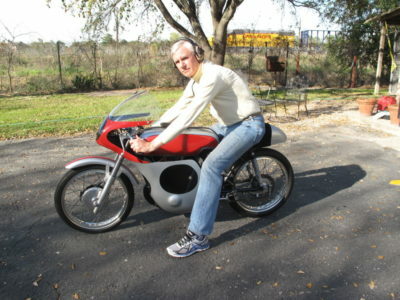 A Yamaha R6 would not be what it is if the Norton Manx had not existed. The factory riders like Geoff Duke raced them, and the poor non factory riders too. It was the bike to have to win until the multi-cylinder machines arrived on the scene, and even then the Nortons gave them a hard time, as they where so easy to ride and not over powering. So we are still racing them with a passion that has no equal; going to the race track only to try and win. Our crew, mechanics, riders technicians, suppliers, sponsors and friends are the best, and all gel together to always make a friendly but serious race weekend happen with Champagne always flowing at the end of the day…. We are already working hard on this years program, with the machines being torn down and inspected. Better getting the maintenance done early so as not to have any bad surprises later. Sadly, we lost Bob McKeever January 31, 2017. He passed away in his sleep, and while gone, will never be forgotten. Bob McKeever was a Norton Manx racer, finishing 14th in the 1948 Daytona 200 on the beach out of 155 – 1st Norton Manx to cross the finish line. Back into racing with AHRMA in the 1970’s, Bob sponsored Stu Rogers, and later, Alex McLean to ride his Nortons. 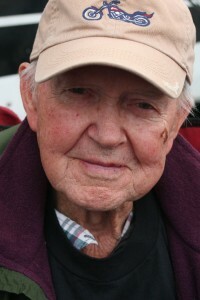 Bob continued coming to the track even as he reached 96. We were thankful to have him with us one final time at Barber in 2016. Bob said he was a rider, not a mechanic, but he always had good guidance as to what should be done. 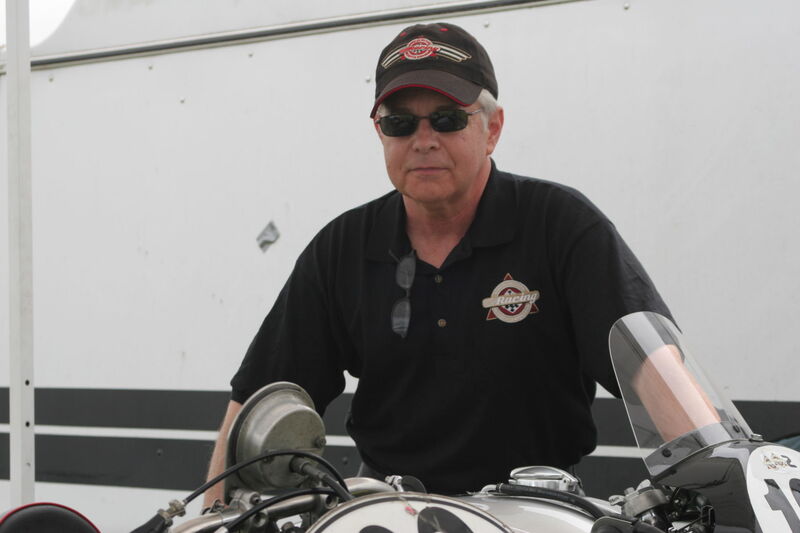 In the article “Our inspiration… Bob McKeever” which appeared in Motorcycles Classic’s written by Richard Bachus, Bob’s motorcycle history is perfectly represented. Rob has been managing the team since around 2011. He is a wealth of knowledge concerning the Norton Manxes, keeps them running perfectly and always looking good. Rob’s Norton technical research and his thirst of knowledge has made him into a Manx pro. Always mechanically updating the machines, his Norton Manxes are some of the best in their classes in the U.S.
Alex McLean, born in Texas, raced in the mid 1970′s in France onboard Yamaha TD2’s and TD3’s. He became a photographer for the next years in Paris and NYC. But racing caught up to him when he met Nobby Clark while doing a motorcycle magazine article in the late ’80s. Racing a Suzuki 250 at Daytona he met Bob McKeever and his friends and soon after received a phone call to race for him, replacing Stu Rogers. He has won many races and championships with the Nortons, this past year 5 championships with AHRMA. He has raced twice at the Isle of Man, 1998 the Manx GP taking 2nd in the Newcomer’s class, then 1999 the T.T. Now with over 20 years of experience on the Nortons, Alex has gained a reputation for riding them smoothly and quickly around the track. Cindy McLean started racing in 2014 with Alex’ encouragement. She successfully completed her first year racing, winning 2nd overall in her class, and the Rookie of the Year Award. 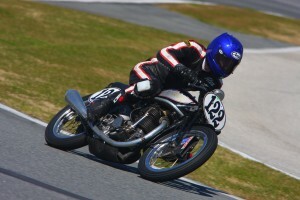 She took 2nd in class again in 2015, and continues to compete in Novice Historic Production Lightweight and in 2016 started racing Bob McKeever’s 1958 Norton International in the Classic 60’s class. 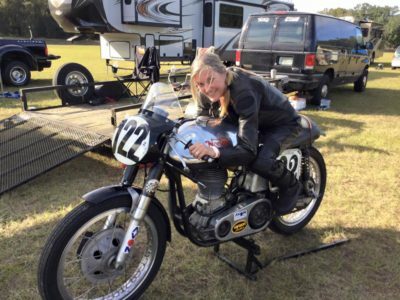 She is managing partner of CHill Concepts, LLC doing website design and online marketing, and is an active volunteer, serving on the executive committee for “Riding into History” and anything relating to vintage motorcycling and cars. Difficult not to know who Nobby Clark is…. 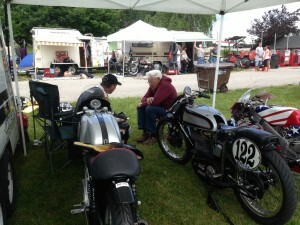 but he comes to the AHRMA races whenever possible, with us as mechanic and guru advisor. Part of the McKeever/Norton Manx race team for the past 15 years or more, it is always an honor to be with him in the paddock, and gives us a psychological edge over other competitors. Nobby is in AMA Hall of Fame, and of course wrenched for all the champions of the 1960- 1980 era. Watch out for that grin…. Joe Clements was Bob McKeever’s mechanic at the Daytona 200 in 1948. He is a master machinist, having worked on parts of the A bomb at Los Alamos, N.M. Only 2 months younger than Bob McKeever. He always finds what is wrong with the bike before everyone else. His mechanical awareness is unequaled, finding and fixing problems quickly. Always instrumental in winning the race. Maurice Candy and Alex McLean at Grattan Mi. having a top secret meeting. You will notice no tools needed…. Maurice Candy does all our serious motor work. He has been playing with Norton Manx’s for long time, and does them right, just ask Tim Joyce, AHRMA 500GP Champion now for a long time. He has raced sidecars in England and the IOM. When he works on the motors, if he thinks he can do better with another part, well he either makes it, or has it made to his specifications. He gives us little tips on how to go faster, either riding or mechanical, and if you follow his council, you usually have a good weekend. Get him a pint of New Castle Ale and he might give you some tips too…. 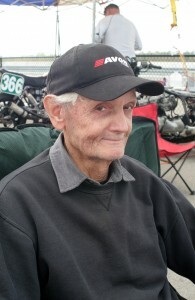 Bob Blakely is our sponsor at large, comes to the races whenever he can, lets Alex ride bikes of his collection and has sponsored him on a Honda Rs125r for the past years, SOS 2 stroke championship wins too! He is thinking of getting back into racing action himself in 2014. He makes Alex ride faster with this diversity of equipment.